Von: Nardini, R., Casolari, E.
4LAND Map N. 146. 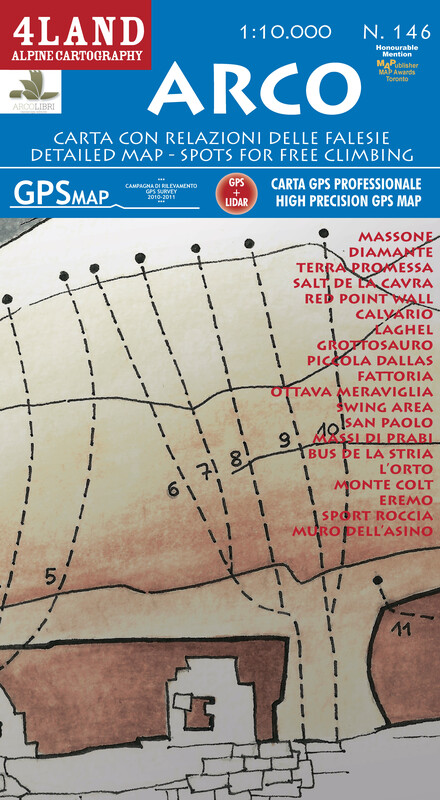 Special map of Arco, highly detailed expecially designed for free climbing. Are reported all the climbing spots, with a list of information for each one: Pitches maximum length, approching time from nearest parking, aspect and best season to climb, grades range, if it is suited for family and highlighted the path to reach it from the nearest parking. All trails, roads and points of interest, including the climbing spots and the path to reach it, were recorded in the field using GPS devices. Reference map for Trentino Mountain Rescue. It is designed expecially for climbers, but it also ideal for hiking in the surroundings of Arco.